ASP 07403 Government M16/AR15 Training Red Gun FREE SHIPPING! 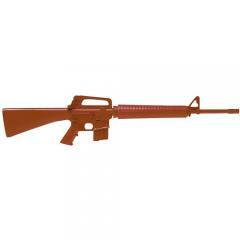 Firearm simulator urethane Government M16/AR15 replica for law enforcement and military training. Red Guns are realistic, lightweight replicas of actual law enforcement equipment. This Red Gun is ideal for weapon retention, disarming, room clearance and sudden assault training. Can I affix a U.S. Marine Corps bayonet to this rifle? According to ASP, you cannot affix a bayonet. ©2002-2019 CopsPlus.com: ASP 07403 Government M16/AR15 Training Red Gun FREE SHIPPING!